Empowered by core values, Quincy Capital Partners help asset managers expand their reach and marketshare. The commitment to independence and objectivity empowers Quincy Capital Partners to create unbiased solutions based on your goals. Creating customized distribution plans helps investment managers be more productive, manage their portfolios, and accelerate client acquisition. Quincy Capital Partners listens to Financial Advisors needs pertaining to investment vehicles and business partners. As such, the focus of Quincy Capital Partners business is to connect opportunities with interested capital sources. Quincy Capital Partners will build capacity to extend your reach. Go slow or fast to achieve a national footprint. You manage the process with pre-defined phases implemented and resources. 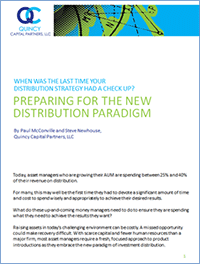 New asset managers can take advantage of our 4 X 4 X 4 X 4 % Distribution Strategy.